Oh BlueOregon community, you really are an awesome bunch. We were able to deliver the gun safety petition to the Oregon Senate with 2731 signatures. Thank you for standing up for reasonable, common sense legislation. Signatures to the petition came from ALL OVER THE STATE - from over 230 zip codes. This was no Portland-area thing. Oregonians from Pendleton, Klamath Falls, Roseburg and Coos Bay signed too. We saw signatures come in from the LaGrande, Medford and Bend areas, as well. People from all over the Willamette Valley, the Coast, Central Oregon, Eastern Oregon, Southern Oregon took part in signing. We weren't sure what to expect when we launched this petition, but it sure is cool to see people from all over the state take part. 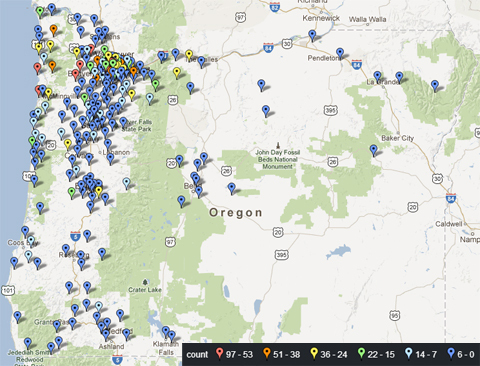 Thanks everyone for helping BlueOregon Action kick off to an amazing start.